So I am probably one of the least fashionable person when it comes to pjs. I remember when I was little I had matching pants and shirts (probably from gap) and I refused to mix. My shirt had to be the exact same pattern as my pants and had to match perfectly. Now, every night I sleep in norts (nike shorts) and an oversized t-shirt. Not sure when exactly I made that switch. I have this dream that one day I’ll have a drawer full of super fancy pajamas, but until then I’ll stick to my norts and oversize, baggy, t-shirts. I have slept in them the last 2 nights (yes I brought them to NYC with me). They are literally the cutest thing ever and I’m ready to buy a pair in every color. Do you think it’s acceptable to wear them in public? Because I’m ready to take that step. If you’re debating about clicking the purchase button, don’t hesitate. I swear you won’t be disappointed. The day I received them in the mail practically changed my life. They are also available on her website here! Make sure to enter the giveaway for a chance to win! my friend is going to have her first baby and those monogrammed baby clothes would be perfect for the baby shower! These shorts are my favorite thing from the website! Absolutely love the bandeau bathing suit top and the tote! I'm obsessed with monograms and this is the perfect site for unique product! My favorite product is the seersucker nightgowns because they're so different, but really cute! These are TOO cute! I would loveeee to have a pair! 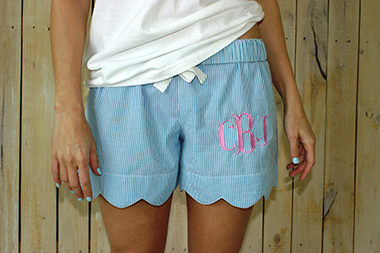 Honestly I love the monogrammed lounge shorts! They are the cutest! I'm crossing my fingers for a pair! My favorite item would have to be these shorts because like you mentioned, they combine so many of my favorite things! Plus, like you I always sleep in boring pjs, so I would love to add these into my rotation! I love the shorts because they are cute and comfy for lounging but would also be cute in public, at least at the beach or pool! I love the shorts! so adorable! The Girl's Ruffle Go Pack Shirt is adorable! As well as these shorts! These shorts are adorable and by far my fave! Thanks for the generous giveaway! Love these! Monograms make everything even better! Love those shorts! Seersucker is my favorite! Scallops, seersucker, and a monogram, the absolute perfect combination! What cute shorts! I love their floppy hat - so cute! I love the hat. I've been looking for one just like that for the beach. 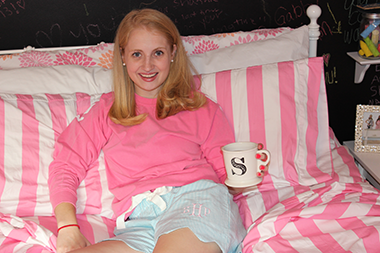 The scallop sleep shorts are seriously the cutest thing ever! They seem like the perfect length too, not to short! loving the bathing suit tops and the coverups! I love the scalloped swimsuit cover up! They are super cute! I like the Swim Bandeau Top with Monogram! I'm in love with e-v-e-r-y-t-h-i-n-g! !